Dr. Yul D. Ejnes is employed by Coastal Medical, Inc. and is certified in Internal Medicine. He lives in Glocester, Rhode Island and is a member of the ABIM Board of Directors and Internal Medicine Board, which oversees the program and products for the Internal Medicine certificate. Why did you want to become a physician? I wanted to become a physician because as a child, I was fascinated by the doctor’s instruments and wanted to make people feel better. Later in life, I realized that being a physician combined my love of science and technology, my enjoyment of working with people—especially over a long period of time—and the opportunity to make a difference. What’s the best advice you’ve received as a doctor? Never skip lunch. That was not nutritional advice that one of my attendings gave me, but instead, a reminder to slow down every once in a while and take a few minutes to take care of yourself. In other words, if you skip lunch, it means you’re working too hard. What’s been the proudest moment of your career? One of the proudest moments in my career has been being selected to serve as Chair of the American College of Physicians Board of Regents. Specifically, the first time I sat in the Chair’s seat in the board room and realized that I was leading this group of distinguished and accomplished internists. If someone had told me when I finished residency I would someday be in that seat, I would have laughed hysterically. What is one of the biggest misconceptions about doctors? One of the biggest misconceptions about doctors is that our work hours are the same as our office hours, and that is not true. For example, my usual hours for patient appointments are 8:30 a.m. to 4:30 p.m. except on Tuesdays, when I see patients in the evening. However, I’m usually not out of the office until 6:30 or 7:00 p.m. or sometimes later, reviewing labs, correspondence, returning phone calls and performing other patient care activities. Even through most of the “lunch hour,” I’m working at my desk (but not forgetting to eat lunch, as I discussed above). Patients are often surprised when I call them at dinnertime to report a lab result, saying “you’re working late,” when in fact, it is normal. Why do you serve on ABIM governance? It is an important time for internists, especially those in full-time community practice, to get involved with ABIM. I see service as a great opportunity to play a meaningful role in improving Maintenance of Certification (MOC) and helping to restore the trust and respect of the community in the Board. What did you learn before and after joining an ABIM board/committee? I didn’t know that the initial certification and the MOC examinations had the same blueprint and pass score; in other words, that they were the same examination. However, after joining I learned that we could change the initial certification and MOC exams to make them different -and we did. After joining, I met many internists from different parts of the country and various practice settings, including community-based practices, who share my interest in making things better. Dr. Ejnes discusses how MOC is an eye opening process that highlights the importance of keeping up with changes in medical knowledge. What is the best thing about serving? Being able to change things, rather than just complain about things. 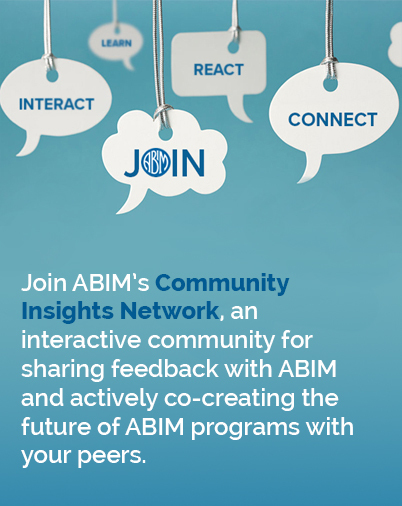 I would encourage others to join ABIM governance because it’s a way to share your perspective and those of your colleagues to improve the work that ABIM does. It’s a great learning opportunity and a chance to network with fellow internists. What’s the most challenging thing about serving? Communicating the progress that we’re making to audiences that aren’t always interested in listening. What is something your colleagues may not know about you? I will often choose an entree in a restaurant based on whether it includes french fries. I love french fries. Aside from medicine, I am also interested in cooking all cuisines. Board Certified Internists, how do we love thee?